One of the most frequently played songs at Jewish weddings for the last few decades has been Yidden Yidden, Kumt Aheim, the fervent dance introduced by Mordechai Werdyger (professionally known as Mordechai Ben David, or MBD) in 1986. Everybody assumes that it's a Jewish song. But like Hatikva (adapted from an Italian madrigal) and some other popular Jewish songs, it has its origins in a country and culture that is in no way Jewish. The reality is that the music that we recognize as Yidden first appeared at the Eurovision song competition in 1979, the year that saw Israel win first place for the song Hallelujah by the group called Milk and Honey. 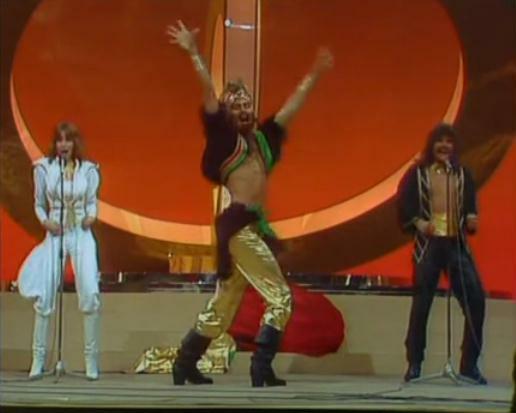 That year, Germany entered the competition with a song praising the strength and sexual prowess of Genghis Khan, the 13th century Mongol conqueror. The song is titled Dschinghis Khan, by a band of the same name. And we have heard that all the women fell for him, so they say. Here's the video, sung in the original German. Here's the same song, now in Yiddish, sung at a Chabad telethon by MBD, often referred to in Orthodox and Chassidic circles as the King of Jewish Music. OK, since we mentioned Hallelujah, we'll give you a bonus for the sake of nostalgia and include a video of the winning song. Enjoy! I wonder how many others immediately thought of The Village People when the first clip began. Thanks Al, as always. I'll be using the version of 'Hallelujah' in my next mailing. In an interesting twist, MBD neither credited the writers of the original tune, nor paid them royalties for its use; all while publicly decrying "music piracy" and copyright violations in numerous video-clips and interviews. How do you say "hypocrite" in Yiddish?! ?